"On October 23, the Morton County Sheriff’s Department announced it had shot down a drone after it had approached a police helicopter 'in a threatening manner.' Soon after, it petitioned the FAA for the TFR, which extends until at least Friday (in the past, TFRs have been immediately renewed after they expire). The TFR says 'no pilots may operate an aircraft in the areas covered by this Notice to Airmen,' however it carves out an exception for 'response aircraft in support of law enforcement aircraft,' meaning that police aircraft continue to monitor the protesters’ camps. 'In essence, a ‘giant tarp’ has been laid over the site, allowing law enforcement to act with impunity and without any witnesses,' Peter Sachs, a drone law attorney in Connecticut, wrote on his blog earlier this week. Gutterman of Syracuse University told me the TFR has 'the effect of prior restraint,' an established First Amendment violation in which the government places a restriction on expression before it can take place." I have seen some of their drone footage and in my opinion they blatantly and consistently violate FAA rules about flying over people. They fly, to my mind, in a threatening manner close to the police. I think the police had every right to shoot at the quadcopter in the video I've seen. While you can't help but feel the CAA stopped trying by the time it got to the letter "O," there's no doubt that some drone pilots could use some common sense. Earlier this month it emerged that airline pilots reported four near misses with drones in a month, including one flying near London's Shard and another at Liverpool airport"
I hope people get the message. I would say this guy is ignoring the FAA rules about flying over private property. But oh well. I just hope he knows the FAA could come after him. "AeroVironment is emphasizing the drone’s ease of use: the operator plans a mission withthe tablet by tracing his finger over a map. The system guides the operator through a simple pre-flight check. The operator then presses the “fly” button, and the drone autonomously takes off, flies the mission and lands. The Quantix carries color and multispectral sensors. AeroVironment says the DSS uses proprietary algorithms to produce high-resolution datasets and analyses of crops, bridges, roads, railways, pipelines and other assets." so now you don't even need to know how to fly. "A Canadian airliner with 54 passengers on board had to swerve to avoid a suspected drone near Toronto early on Monday, slightly injuring two cabin crew, in the most serious case of its kind in Canada, officials said. said Genevieve Corbin, a spokeswoman for the Transportation Safety Board of Canada (TSB). Corbin said the object was most likely a drone." It's very simple, follow the rules! Stay away from airports! Duh! This show that you can use drone swarms for wonderful things. Let's keep it that way. "GoPro estimates that 2,500 Karma drones have been sold so far, and all of them are subject to this recall. The company decided to issue the recall because a small number of drones reportedly "lost power during operation" for unknown reasons. GoPro did state that no injuries or property damage have been reported as a result of this issue, but it's unknown exactly how many of the 2,500 drones have been affected by this problem." well that escalated quickly. I hope it's a quick fix and I'm glad I haven't decided which quadcopter to buy yet. "Firefighters tested the small unmanned aircraft at an indoor swimming pool on Wednesday. The exercise envisioned a person who had been swept downstream in a river clogged with debris and fallen trees. The firefighters maneuvered a drone with a camera attached and located the victim using a heat detector. They then dropped a small buoy to rescue the person. The Tokyo Fire Department currently uses helicopters for rescue operations. It is studying the use of drones at sites that present risks of secondary disasters." "The Mine Kafon Drone flies over dangerous areas to map, detect and detonate landmines from a safe distance. The drone works autonomously equipped with three separate interchangeable robotic extensions. These three methodologies combined makes the MKD up to 20 times faster than traditional demining technologies. As well as being safer, it also up to 200 times cheaper." "On Friday afternoon police officers arrested Eric Wamser, 57, of Foresthill, California. He’s being charged with interfering with firefighting operations. Wamser was allegedly taking aerial footage of the fire with his drone, though the model he was using has not been released. Police claim that Wamser posted some of the footage on social media, which helped lead to his arrest. As the Wall Street Journal notes, there have been over a dozen hobby drones spotted near wildfires so far this year. And according to the U. S. Forest Service, firefighting aircraft in the United States have had to be grounded six times due to hobby drones interfering with their operations in 2016." It's probably going to take a few such arrests before the gravity of such sinks in to the idiots who won't listen otherwise. "An additional $20 million are needed to deal with Islamic State’s reconnaissance and bomber drones, the US Defense Department has told Congress. The money will be spent in addition to the $190 million already allocated to countering terrorist networks. The money is expected to be given to the Joint Improvised-Threat Defeat Organization (JIDO), the Pentagon’s special office dealing with improvised explosive devices, Defense News reports. By the end of 2016, the JIDO with a budget to deal with new IED threats that emerged during the campaigns in Afghanistan and Iraq, will become a permanent establishment under the Defense Threat Reduction Agency." This is indeed a threat. But it's the usual defense vs. offense escalation that comes with any new device. Should robots be used to kill people? "Fearing additional casualties, the officers deployed a small, remote-controlled robot to carry an explosive device near shooter Micah Xavier Johnson, 25, which they then detonated, killing him. 'We saw no other option but to use our bomb robot and place a device on its extension for it to detonate where the suspect was,' Police Chief David Brown said at a news conference Friday morning.' Other options would have exposed our officers to grave danger .… We have confirmed that he's been deceased because of the detonation of the bomb.'" They could have used a quadcopter in certain circumstances. Is this acceptable? More things to think about. In a way, delivering a piece of lead very fast, or a small bomb much more slowly are not that different. "Of course, not just rich people want to protect themselves against drones. Lee Jones, a Dedrone manager, explains that the German startup wants to sell to jails, prisons, embassies, police stations, military facilities, data centers, and even sports arenas. Earlier this year, the company announced a deal with the New York Mets baseball team to install 11 trackers along the outside of Citi Field in Queens. The company also has a deal with the Suffolk County Prison to help to keep out unwanted contraband. For now, DroneTracker's capabilities are detection-only." Ok, so you know there are drones around. then what? "To enter the contest, you need to publish your aerial photos at www.dronestagr.am. The election of the best aerial photos will be conducted by Dronestagram and National Geographic. The competition will be judged on creativity, photographic quality and respect of each category." "The gadget, powered by a battery in a backpack, has two triggers that allow operators to choose how they want to take down a drone: by remote control disruption of command-and-control signals sent by the operator of a drone trespassing in restricted airspace, or by disrupting its automatic guidance system." It's good to see people working on this, trying to come up with ways that simply disable the drone. I hope they are considering swarms as well. "...researchers from Harvard University, Massachusetts Institute of Technology and several other institutions have created a minuscule wing-flapping robot that literally turns the problem on its head—with a disklike top that can cling to most surfaces using static electricity, much like rubbing a balloon and sticking it onto a wall." "The ability to hang from a structure rather than rest on top also provides the MAV with a less-obstructed view of the area below and protection from extreme weather conditions during long perching sessions. The headfirst electrostatic approach works by changing the charge distribution of the material to which it is clinging, Graule says. This works best with a smooth texture, so the drone can adhere better to something like a window than to a rough or porous surface. The MAV’s electroadhesive connection is not particularly strong, however, which means the drones need to weigh in at roughly 84 milligrams—less than a bee. In order to relaunch the drone cuts power to the circular copper electrodes in its disk and restarts its wings." That would be great to find a high point, attach yourself, and look around. Then head over somewhere else if necessary for a better view. Brilliant! "The drone 'killer' getting the most attention at Sea Air Space was the DroneDefender, a system developed by researchers at the nonprofit research and development organization Battelle. DroneDefender is a two-pronged drone jammer—it can disrupt command-and-control signals from a remote operator or disrupt automatic GPS or GLONASS guidance, depending on which of the devices' two triggers is pulled. Powered by a small backpack, DroneDefender looks like some futuristic over-under, radio-frequency shotgun-grenade launcher. Targeted through a simple optical sight, the device has a range of about 400 meters. Battelle calls it a 'directed RF energy weapon'—it sends out a jamming signal in the Industrial, Scientific and Medical (ISM) bands or global positioning bands in a 30-degree cone around the point of aim. Aboard the Department of Defense's Stiletto 'marine demonstrator' boat, Jake Sullivan was showing off his company's own counter-drone "gun," the Dronebuster. Sullivan, chief technology officer of California-based Flex Force, said that his company began development of Dronebuster shortly after drones interfered with firefighters in California last year. The intent was to develop something for first-responders and local law enforcement." "Run by the Navy, the Stiletto now gives companies a place to test their gear at sea. A version of the Dronebuster is already in the hands of some federal government customers. That device uses broadband jamming like the DroneDefender. It has the advantage of being much smaller than the DroneDefender, and it can be aimed using optical sights or an integrated radio frequency power meter and signal analyzer. Someone trained on the device can even distinguish what kind of signal is being emitted from the drone—telemetry (such as remote video streaming) or control. Still, its jamming technology makes it illegal to use in the US. But a new version being developed by Flex Force operates completely within FCC regulations, though depending on what kind of drone is targeted, the new device may require an FCC license. Instead of jamming C&C signals, the new Dronebuster exploits weaknesses in the drone communications protocols themselves, enabling the Dronebuster's operator to trigger the 'fly home' command on some drones and the 'land' command on others. It does so by cycling through command sets for various drone systems." These are good things to have. I wonder if there would ever be a need for the public to own such things? "This drone flew over a medieval historical reenactment in Russia. A warrior on the ground who is clearly a master of his weapon knocked it out of the sky with a well-placed spear. He wasn't the least bit afraid of this witchcraft in his midst." I suppose he was mad because quadcopters aren't a part of Medeival lore. "Unmanned aircraft systems represent a relatively new technology that offer a wide range of opportunities for agriculture. In fact, most projections indicate that the largest single market for UAS will be in support of agriculture. Unmanned aircraft systems have the potential to make significant contributions to sustainable agriculture and secure food production. Initially this will be accomplished through near real-time data collection for enhanced awareness of complex agricultural systems and associated decision-making, leading eventually to active intervention by UAS as needs arise within the agricultural system. At the same, time there is a great deal of uncertainty about this emerging technology, especially as it relates to agriculture." I heard a guy on the radio in North Dakota talking about his uses of drones and the research they were doing. This does look like a very good use of the technology. "Drones will be the first widely deployed mobile robots and the first cutting edge aerospace products available to consumers. We are a team of experts in computer vision, robotics, and consumer electronics from places like MIT, Stanford, Google, Apple, and Tesla working to make autonomous flight a trusted, useful, and magical part of life." " Police say a British Airways flight from Geneva hit an object believed to be a drone while on approach to London's Heathrow Airport. The airline says the plane landed safely Sunday afternoon and has been cleared for its next flight." Unfortunately, we'll always have idiots amongst us. Thus the need for severe penalties for things like this. "As previously revealed by DARPA, Gremlins aims to develop fleets of 'low-cost, reusable unmanned air systems' (aka drones) that can be launched from other aircraft, perform their missions, and then return to land back aboard their motherships -- an acrobatic feat to be performed entirely midair. While Gremlins will be too small to engage in combat operations, the drones will be equipped with sensors and electronic equipment capable of performing surveillance and reconnaissance missions, and also electronic warfare -- jamming, spoofing, and otherwise frustrating opposing radar systems." Looks interesting and useful. I think swarms of smaller, cheaper craft will be used more and more as people figure out how best to utilize them. I call them the whirling blades of doom. 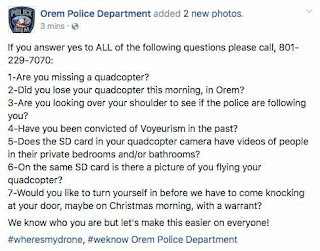 Stay away from idiots flying quadcopters near crowds. "The first IDRA event to be showcased by ESPN, 2016 U.S. National Drone Racing Championships, will crown the coveted title of fastest drone pilot in the United States. The race will be held on Governors Island, New York City, August 5th-7th, offering jaw-dropping views of both lower Manhattan and the Statue of Liberty. The U.S. National Drone Racing Championships will have an enjoyable summer festival atmosphere that racing fans appreciate—family entertainment, a ‘makers’ style drone racing area for kids, state-of-the-art technology, food, drink, and drone vendors." "The new system will only need a few hours exposure to the sun and be ready to hunt enemy subs for the US navy. Designed to 'launch and forget', the new drone will be left on water for 23 hours and fly for an hour each day according to Dr. Jones." Inventiveness is making quadcopters useful everywhere! Even though the newest drone from DJI is recognizable as being part of the Phantom series (with the exception of the red stripes, which are now missing), it has been completely redesigned to be better and easier to use than any of the company’s previous models. This is not an incremental upgrade — it’s a major leap forward in the consumer drone experience. Robust new autonomous features make the DJI Phantom 4 an excellent choice for drone beginners. Optical sensors are employed for obstacle avoidance, which significantly reduces the chances of a crash or collision. ActiveTrack lets you set the Phantom 4 to automatically follow you, autonomously and with obstacle avoidance engaged. Advanced drone pilots will appreciate the wicked Sport Mode that lets the DJI Phantom 4 hit air speeds of 44 miles per hour." This might be the drone I'm looking for! But I'm still waiting for the Gopro to come out. "About 20 Mines students are building from scratch a drone that can fly autonomously, detect certain objects on the ground and transmit images in real time. The creators, all undergraduate members of the school’s Unmanned Aerial Systems club, are putting together the machine to compete in an international student competition in June in Maryland. The students, including engineering, physics and computer science majors, have been working on the six-rotor, 5-pound drone on their own time for a year. Some of the students have gotten so attached to their creation, club President Marcus Weibe said, that they’ve decided to call it Herbert. Besides performing in competitions, Herbert can someday also help with search-and-rescue operations, as well as monitoring forest fires, said Dan Dolan, a Mines professor of mechanical engineering who started the club in 2004." I was on campus one day and watched their drone follow a red balloon around. "Toby Brusseau has been flying drones for several years and his footage his been used in both national and international outlets. By using this technology, Brusseau is able to safely achieve beautiful shots for amazing content and various promotional avenues. Most recently, he has accumulated a library of rare imagery, which is available for license, as demonstrated below." A man in Louisville, KY, blasted his neighbor’s drone worth over $1,800 because he said the drone flew over his backyard while his teenage daughters were sunbathing. A man in Lower Township, NJ, shot down a drone that was flying near his property and photographing a house construction taking place next door. A man in Modesto, CA, riddled a drone with shotgun pellets because he thought his neighbor’s drone was part of a CIA surveillance conspiracy. "If all else fails, you can find a local flight club that can help you with the specifics in your area. You can search the Academy of Model Aeronautics for a local chapter. You may also get lucky and find some active groups on sites like Meetup. Unfortunately, for now finding a place to safely fly is still a bit of a mess until the FAA makes their process for notifying airports easier. 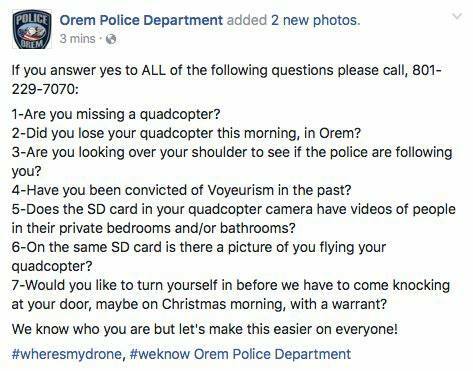 In the meantime, if you’re not sure it’s legal to fly (or if you think you might have flown outside a legal fly zone), be courteous and bring your drone down if you’re asked. Especially if that request comes from law enforcement, or from any property owners you may be hovering over." It's good to remember the rules. "With its agile but classy and elegant flight characteristics, AEROTAIN's Skye is the Bentley of aerial platforms, offering new horizons in aerial entertainment. Lifted by helium and powered by electrical motors which are merely used for movements, Skye is like an eye in the sky: It can perform any translation while having any orientation. Thanks to this patented technology, astonishing movements such as a rolling football can be flown. No currently available UAV allows such a degree of freedom. Unique safety features enables it to fly over crowded places and closely approach people. The visibility leads to a friendly appearance and can be used to depict a product for advertising purposes and even take its shape. Scaleable payloads enable Skye to carry heavy cameras for live streams and aerial cinematography." That's pretty cool. and the best part is it's pretty safe. "The pilot of a Lufthansa A380 approaching the airport on a flight from Frankfurt, Germany, reported that a drone passed about overhead around 1:30 p.m., said Ian Gregor, spokesman for the Federal Aviation Administration. The plane was flying at 5,000 feet and was about 14 miles east of the airport, over the heavily populated suburbs of Los Angeles. It landed safely." Some idiot is gonna cause a lot of problems. "Rapid City police are seeking help to identify the operator of a drone that was spotted flying over the scene of an officer-involved shooting on Feb. 28. Police say the operator may have broken the law by flying the drone in the area outside the Cornerstone Rescue Mission where officers responded to the report of a shooting." Since the perpetrator flew right over a bunch of cops, I assume he didn't know the rules. "Much of the fear around drones hitting aircraft has been driven by FAA reports from pilots who have claimed near-misses with small drones. But an investigation last year by the Academy of Model Aeronautics (AMA) found that of the 764 near-miss incidents with drones recorded by the FAA, only 27 of them—3.5 percent—actually were near misses. The rest were just sightings, and those were often sightings that took place when drone operators were following the rules. The FAA also overcounted, including reports where the pilot said explicitly that there was no near miss and some where the flying object wasn't identified, leading the AMA to accuse the FAA of exaggerating the threat in order to get support for its anti-drone agenda. The researchers studied 25 years of FAA 'wildlife strike' data, reports voluntarily filed by pilots after colliding with birds. The data included over 160,000 reported incidents of collisions with birds, of which only 14,314 caused damage—and 80 percent of that number came from collisions with large or medium-sized birds such as geese and ducks." Makes sense to me. But there should still be good rules because some people are idiots. "We’ve taken all those amazing aerial shots you see in the movies and made it a snap (sorry, we can’t resist the pun, more of these coming) for you to recreate them without being a geek. Just hold your phone up, tap where you want Snap to go and send it on it’s way." This has good features. I don't see how to upgrade software for more features. Is this part of it? "A shoulder-mounted, parachute-enabled anti-drone launcher has already attracted interest from the Metropolitan Police, its makers have said. OpenWorks Engineering's SkyWall100 launcher uses compressed air to fire a net into the rotors of an offending aircraft. The Northumberland-based startup says the tangled net will be enough to put a drone out of operation, before returning it to the ground with a built-in parachute." 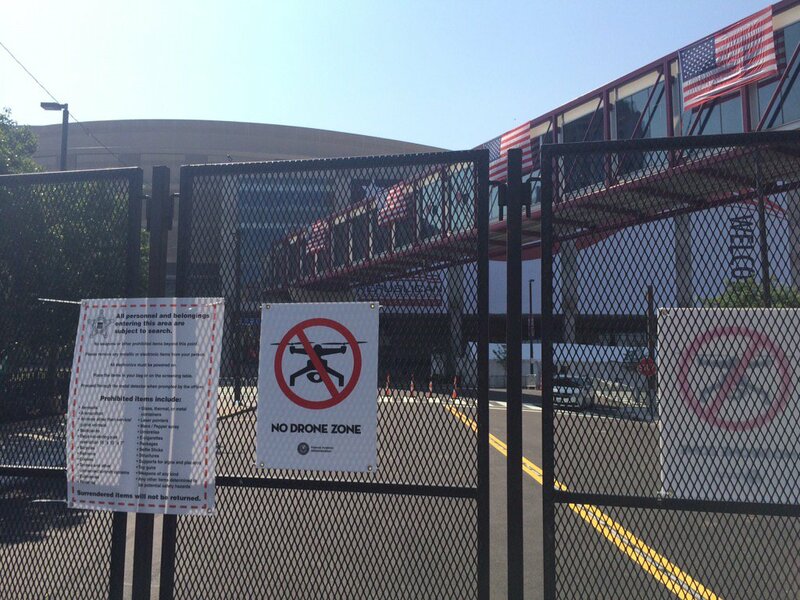 Ok, now THIS looks like a realistic defense against drones. "ow a pair of proposed laws being considered in Connecticut would put an end to arming recreational drones. 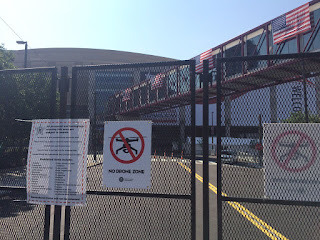 Both bills (one submitted in the Connecticut House of Representatives, the other in the state Senate) use the same language in reference to armed drones." "Of course taken from the cartoon Peanuts where snoopy the dog would pretend to sit on the top of his doghouse and fly it like a plane, the doghouse quadcopter is located on the side of the house so that it takes off completely sideways, but once you get the thing moving it starts to level out. Perfect for any drone collector..."
I'm surprised this works because Snoopy offsets the weight so much. But pretty cool! Taylor bases his argument on a half-page clause in the FAA’s Modernization and Reform Act, which explicitly prohibits the agency from making new rules and regulations regarding model aircraft. In launching the registry, Taylor claims, the FAA has technically created a regulation as well." This will be worth watching. If the FAA loses, it gets punted to Congress. "Working for directors, Producers, Cinematographers composing that perfect shot is demanding, challenging and highly rewarding. It is what we live for! - Understanding your footprint on set, composing the right shot, ensuring your footage is perfectly exposed, balanced and graded in flight so time in post is reduced is what we understand and strive for - not everything is done on the first take - but we listen, we challenge ourselves and now with our new live streaming technology we give the directors a whole new lease on getting that 'perfect shot' live and in flight." I hope to eventually get this good before I die. It is what we live for! - Understanding your footprint on set, composing the right shot, ensuring your footage is perfectly exposed, balanced and graded in flight so time in post is reduced is what we understand and strive for - not everything is done on the first take - but we listen, we challenge ourselves and now with our new live streaming technology we give the directors a whole new lease on getting that "perfect shot" live and in flight.